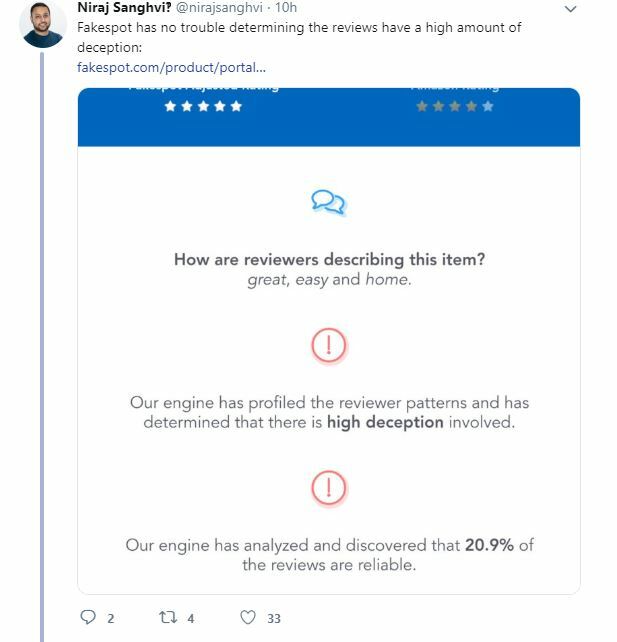 Its been a tough time for Facebook – declining user growth, lost trust and its explosive Cambridge Analytica scandal – the latest assault slams several Facebook employees for leaving glowing 5-star Amazon reviews about its ‘Portal’ smart display. Competing with the likes of Amazon Echo Show, Google Home Hub, Lenovo Smart Display and JBL Link View, the Facebook Portal has struggled to gain traction amid ongoing security concerns. Many consumers are hesitant to bring the Portal (with its camera capabilities) into homes after several Facebook data breaches. Despite being listed as ‘Verified Reviews’, NYT tech commentator, Kevin Roose, discovered three (of the ~100) five star reviews were made by Facebook personnel. Facebook exec Andrew ‘Boz’ Bozworth has seemingly confirmed the offenders are staff (below) – encompassing a Security Engineering Manager, Event Manager and Head of Supply-Chain & Strategic Sourcing (AR/VR products). The news continues to spark user concern over Facebook internal practises, exacerbating falling trust.